Hyperhidrosis is the excess sweating from different parts of your body. It is mainly due to the overactive performance of your sympathetic nervous system. Palmer Hyperhidrosis is the most common type that people suffer from. Many also suffer from plantar Hyperhidrosis. These two can make life very uncomfortable for the people who suffer from them. It can also make personal and social situations a nightmare to deal with. Luckily, there is a highly effective solution that many people have had success with. Things to things to keep in mind when looking to buy your own. Affordability: The device which you choose should be an economical one. You don’t need to spend a fortune on buying a sweat control machine. The size of Machine: Size of the machine could be deciding factor in your choice of Iontophoresis device. For instance, if you travel a lot and wish to continue with your treatment while on the go, then choose one which is portable. You should be able to carry it with yourself. Safety Features: Your body is being exposed to electrical pulses when you use these machines. Make sure you buy one which doesn’t give you an electrical shock. Power Source: Some Iontophoresis devices are battery operated while others are run using direct current. Batteries of these machines have a specific life and are expensive. Therefore, you should choose one which is run using AC/DC power supply. This will help you save a lot of dollars. Timers: You should be very careful with the duration you’re exposing yourself to the currents. Prolonged exposure could cause damages to your body. Thus, buy a machine with a timer. It will turn off after the therapy ends. Manufacturer’s Policy: Have a detailed view of the manufacturer’s policy before investing your money in Iontophoresis machine. Make sure you’re provided with a money back guarantee if you don’t like the product. Also, fulfill your satisfaction about warrant on the quality of the product. There are many machines available in the market. Each comes with its own qualities. Here, we have devised a list of some of the most popular Iontophoresis machines. It is one of the widely used Iontophoresis machines. Due to high effectiveness and small size, it is used in hospitals, clinics, and can be used in homes as well. The device is largely used by professional therapists but is recommended to patients for personal use as well. It is an amazing gadget to have in your collection. Its a great device that is highly recommended. Iontoderma ID-1000 is a competitive name in the world of Iontophoresis treatment devices.The Iontoderma ID-1000 is the best priced main-powered iontophoresis machine on the market. You get the best of both worlds. A plus in device at the price of a battery powered one. It is a plug and plays device which can be used on multiple types of power supply. All you need to do is plug current into the device, add a small amount of water and place your sweaty parts on it. It is most suitable for your hands and feet. It comes at an intermediate price of $399.00 The device folds up into a small travel briefcase, making it easy to travel with. The Iontonderma is a relatively new competitor on the market, but it lives up to the hype. You can easily afford it and enjoy a personal treatment for you sweat problems. Idromed 5 PC is an extensively popular device among the patients of Hyperhidrosis. Due to its high results, it has been used, and recommended, by many professionals. It is small, portable device which can be used on multiple body areas. The term ‘PC’ represents pulse current as it doesn’t have an option to use DC power supply. Moreover, it is also expensive at $725.00 (keep in mind that before you start adding options), making it a huge investment. Despite all the setbacks, it is widely found in the application all over the world. This is due to high levels of performance and associated satisfactory results. The Drionic has been around for years. It has been the go to entry level device for many peolple searching for there first iontophoresis device mainly due to its ease of access, reliability, service life, and lower price range compared to the ones already discussed above. You can easily buy for no more than $198.00, which is extremely low. The portable device has space to place your hands and feet. After few minutes of therapy, you will start feeling the difference. It is portable in nature, allowing you to carry it with yourself, anywhere you want. The setbacks of this device are its low voltage due to the use of batteries for power generation. You cannot join it to an external AC/DC power supply. This makes it less effective compared to its rivals in the market. The Iontoderma ID-1000. A plug in device that starts at $399. That is over 50% percent cheaper than its competitors. Its easy to use, takes about a couple minutes to set up. It also travels easy in a portable briefcase. I use this device myself after doing the research and I highly recommend it. The same results for a fraction of the price. 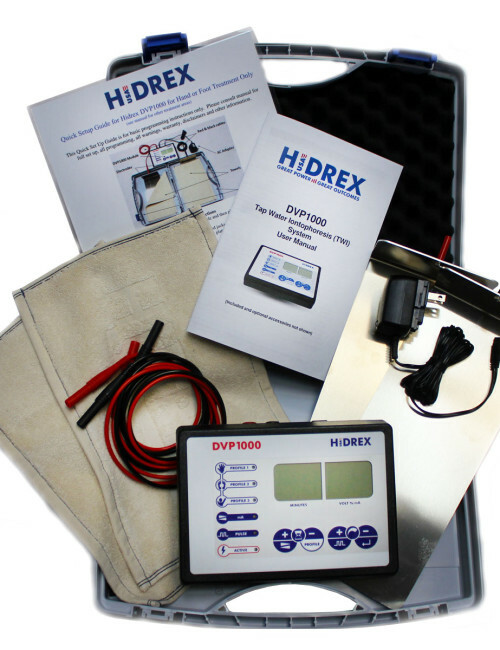 If your looking on going on the high end market, i would recommend the Hidrex DVP1000. It is highly used in doctors offices and is a great choice. I know price is a big factor in most peoples choices. Do your research and pick which one is right for you. What is Iontophoresis Treatment and why is It So Successful? Newer PostWhat is Iontophoresis Treatment and why is It So Successful?